Americans across the country have been priced out of the U.S. housing market since the “recovery” began due to a combination of factors; stagnant wages, private equity purchases and money laundering foreigners. As such, many potential first time buyers have been sidelined despite the availability of meager 3% downpayment loans from the FHA as well as Fannie Mae and Freddie Mac. Fortunately for the U.S. ponzi scheme economy, the U.S. government has a solution. Lower mortgage insurance premiums. 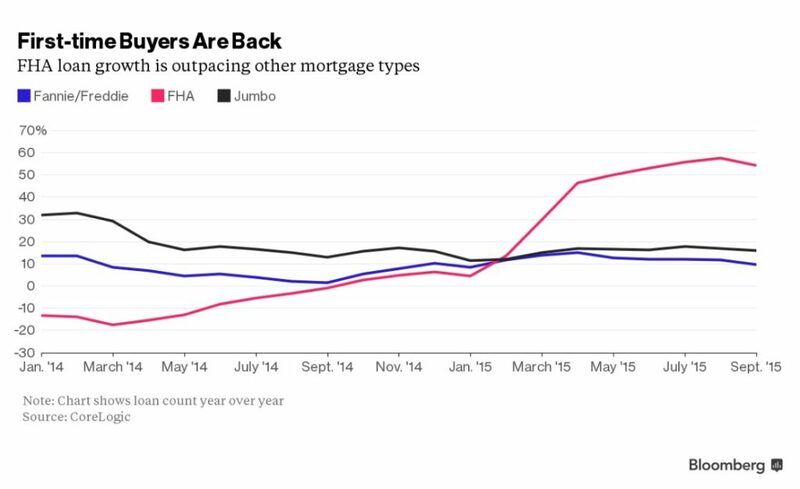 First-time homebuyers are finally jumping into the U.S. property market. Need proof? Look at the mortgage market’s fastest-growing segment: loans with low down payments insured by the Federal Housing Administration. Originations of FHA-backed mortgages, used predominately by first-time buyers, were up 54 percent in September from a year earlier, according to the most recent data from CoreLogic Inc. By December, the FHA insured 22 percent of all loan originations, up from 17 percent a year earlier, according to data compiled by Ellie Mae Inc. Yes you read that right. Up 54%. President Barack Obama’s administration, in January 2015, reduced mortgage-insurance premiums for FHA loans. That lowered the cost of getting a home loan and brought in at least 75,000 new borrowers with credit scores of less than 680, according to a November report from the U.S. Department of Housing and Urban Development. The rate of FHA lending, which had been in decline through most of 2014, tripled the month after the insurance premium was cut, according to CoreLogic. The FHA estimates that borrowers save $900 a year on average as a result of the lower premium. The move made FHA-backed mortgages more competitive with other loans that have low-down-payment options, said Guy Cecala, publisher of the newsletter Inside Mortgage Finance. While mortgage giants Fannie Mae and Freddie Mac have an option for borrowers to put down as little as 3 percent, they require private insurance with risk-adjusted premiums based on credit scores, debt-to-income ratios and other factors. If $900 a year is the difference between buying a home and not buying a home, it might not be such a good idea. As usual, muppets always get fleeced before the cycle turns.